Though the weather stuck its tongue out at me & was all up in my face with its 70-ish temp, Crafty Night: OCTOBER was perfectly autumn inspired nonetheless. 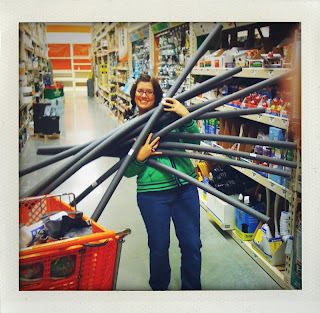 I found the awesome idea for creating a wreath base with pipe insulation, instead of purchasing expensive wreath forms, HERE. I'm on a budget, so I was super excited at that find!! The pipe insulation is 6' long. For my wreath, I cut a piece 44" long & made it into a circle. If it starts to bend, you can stuff newspapers in it. I purchased pipe insulation in both 1" diameter sizes & 3/4" diameter, only because there was a limited supply of the 1" that I wanted. Both sizes of pipe insulation were less than $1.50 each. (The cheapest I found a wreath base was $2.99!) 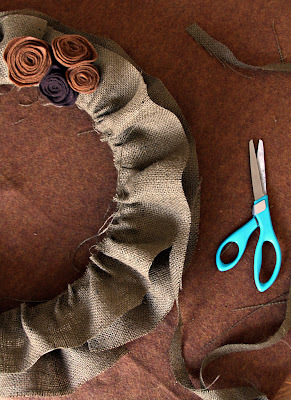 ANYWAY, looking back I would make my wreath a bit smaller, not only so that the 1st piece of burlap wraps around my wreath base in one piece (instead of having to use extra pieces), but also so that when I gather burlap piece #2 & #3 in a ruffle, it would be a bit more "ruffly". But remember this: with that pipe insulation stuff, if you start going smaller in wreath size, it WILL bend & you WILL need to stuff it with papers. Just an FYI. 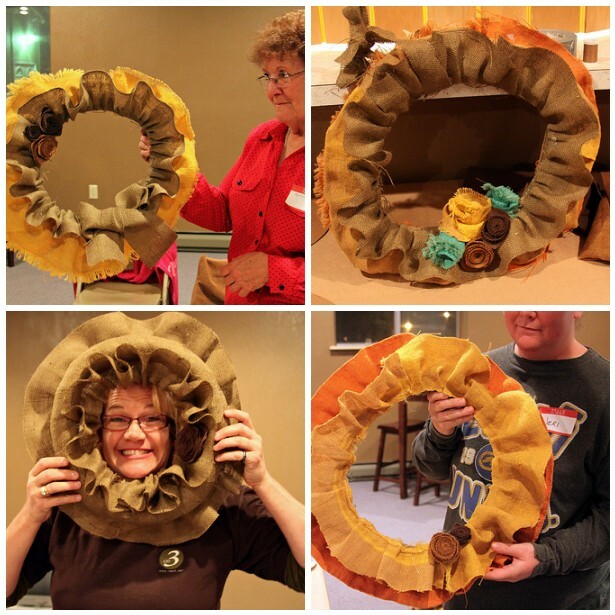 My Crafty Night guests made wreaths in sizes from 40"-44". My burlap was purchased on sale at Joanne's. Still a bit more than I wanted to spend at $2.99/yd. Couldn't even use my 50% off coupon because it was on sale. That was frustrating. Regular price is $3.99/yd. I saw it at Walmart for regualar price of $2.97/yd. Total, this wreath cost about $5.00 to make. 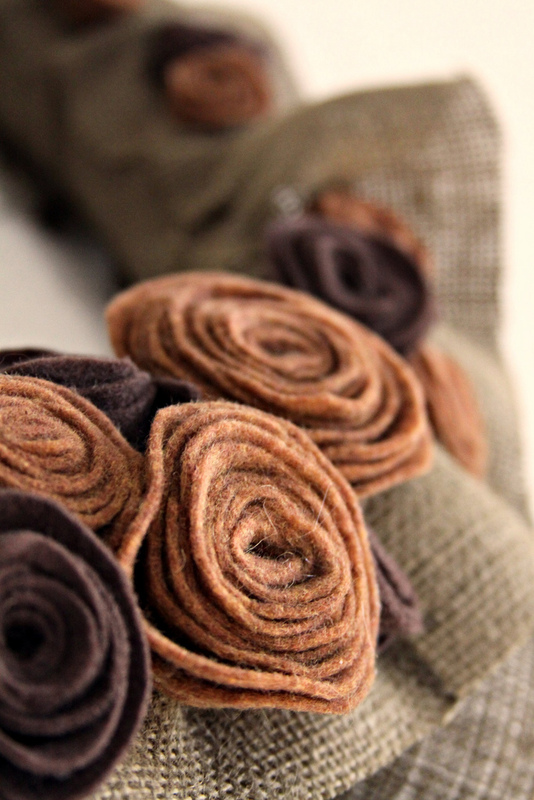 I happened to have some leftover felt from the chair covers I made for Crafty Night. It's a yummy warm brown spice color & I love it! It was purchased by the yard. My color choices by-the-yard were limited, so I had to buy those small rectangle felt pieces in dark brown, which were regularly priced at 34cents each at Joanne's, but on sale for 25cents each. I discovered later that day that Walmart has them regularly priced at 20cents each. 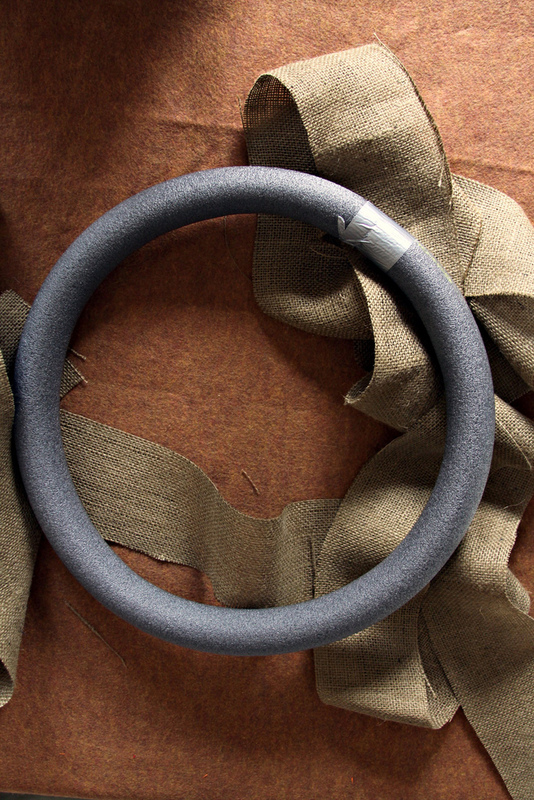 This project uses lots of hot glue, so just cozy up with your hot glue gun. This project is so forgiving. Everything does not have to be perfect. 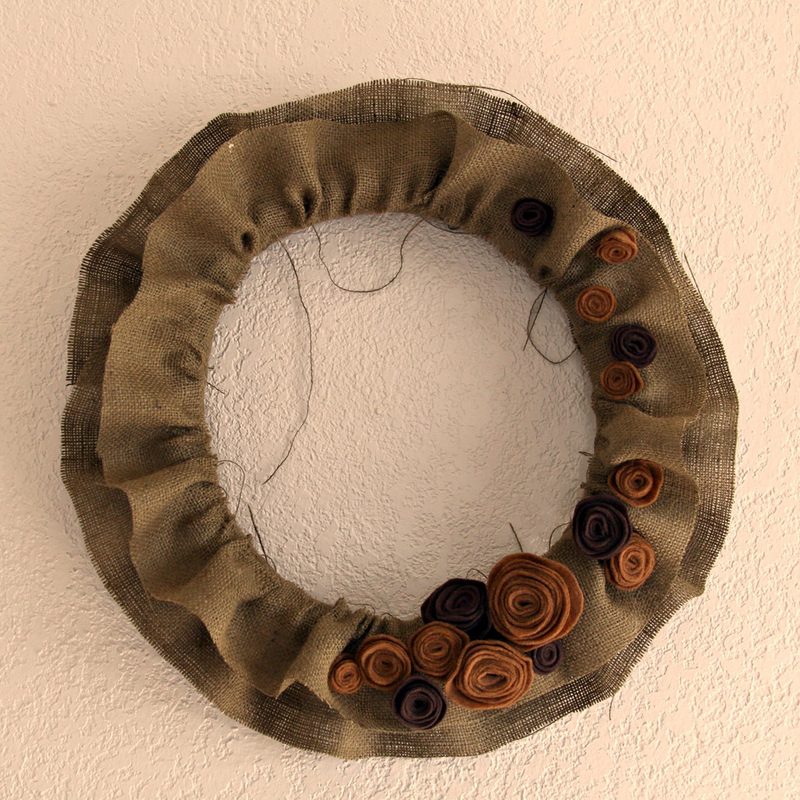 In fact, after I made my wreath, I decided to snip the top ruffled layer so it would be a bit more narrow. While some of my crafty friends were wrestling with the burlap, others were enjoying some tasty wassail that I made. I know, wassail is usually reserved for Christmas. But I couldn't help it. It sounded so yummy! (Mine was rum-less of course.) 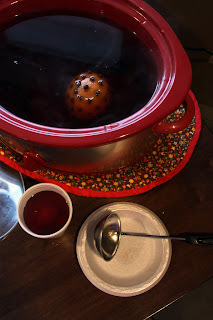 In fact, I did make wassail for Crafty Night: January too. I'll have to post my recipe one of these days. Since we no longer share a meal together before Crafty Night, everyone brought treats to share. It was so fun! We will continue to do this every month. Not mandatory if you want to come & craft, just an "if you want to" thing. Everyone took home a pumpkin pouch favor. I saw the instructions to make these pumpkins from Martha Stewart, HERE. The instructions call for you to cut a 10" circle from crepe paper. I couldn't find crepe paper. I couldn't even find orange tissue paper. But I DID spot a 97cent package of 24 count napkins in bright orange at Walmart. SCORE! And, another bonus: the border around the edge of the napkin created a perfect 10" square. 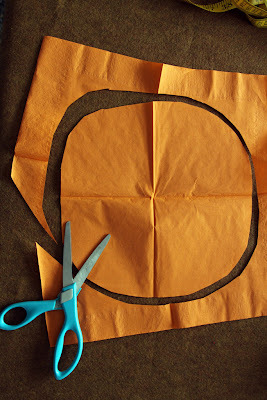 I could just eyeball my circle & cut! 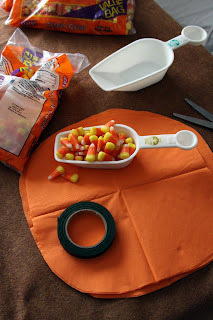 I piled a heaping 1/2 CUP of candy corn onto the middle of the napkin before cinching up, twisting & finishing off with the floral tape stem. 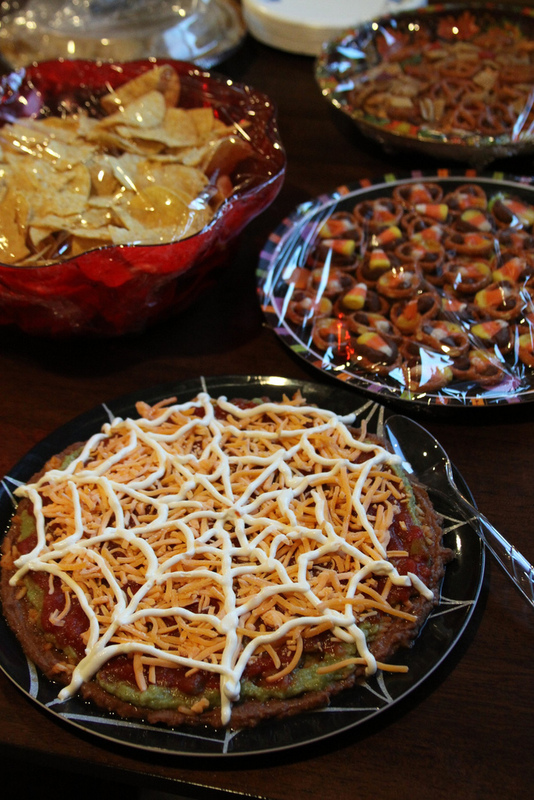 I could get about 5 pumpkins worth of candy from each bag. (Darn, I can't remember which size bag I bought. Not the HUGE bag. It was the $1.98 bag from Walmart.) The floral tape I bought from Joanne's was awful, awful, yucky sticky. It stuck to everything but itself. I don't remember which brand it was, but I will avoid it in the future. To view the complete set of Crafty Night: OCTOBER pictures, click HERE. **THEME: We will be having a crafty competition, pairing up in teams to create something fabulous with mystery supplies provided. But, PLEASE reserve your spot by Sunday, November 9th! Visit the Crafty Night facebook page HERE. I am a new follower! Your blog is awesome! 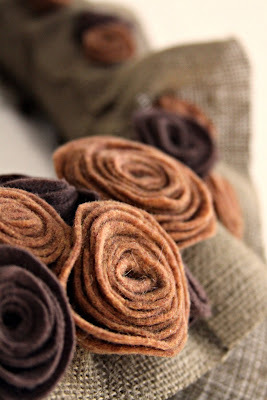 Love the burlap wreath. 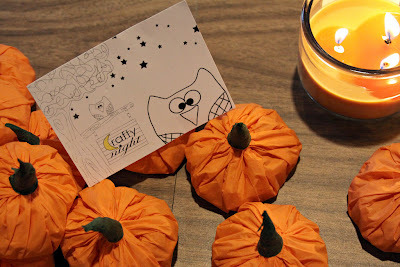 Wish I lived closer, I would join your crafty night! Hi Karen! Thanks for stopping by!